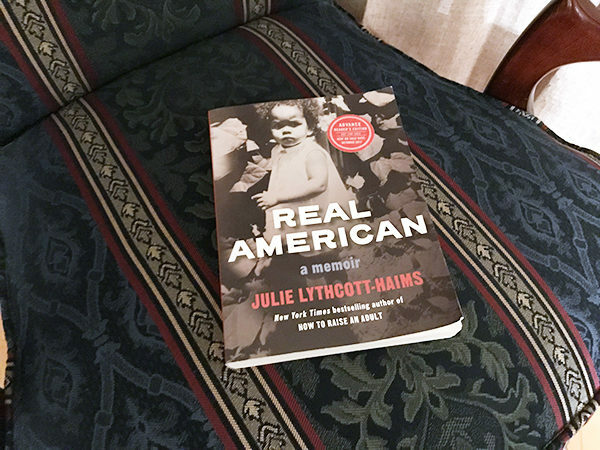 “Real American: A Memoir,” by Julie Lythcott-Haims is a coming of age story of race, self-love and modern racism. When Julie Lythcott-Haims was studying at Stanford University, she encountered a woman at a shopping center who knew a friend she was with. They spoke. “Oh you go to Stanford too?” The sound of her voice is intrigue, wonder, even amazement. It was subtle. A dig or assumption or ingrained belief that a biracial woman who looked brown couldn’t be there on merit alone — she must be on a sports team, there for her athletic prowess. Lythcott-Haims was born to an African-American man and a British white woman, she’s both black and white, though her brown skin means she’s perceived as black always. And though she’d experienced racism before as a brown woman, that time, that instance, needled me. She earned her place at Stanford, and the woman’s words — intentionally or not — seemed to erode that honor. This comes from “Real American: A Memoir,” by Julie Lythcott-Haims, which is being released in October by Henry Holt and Company. Lythcott-Haims, who also wrote “How to Raise an Adult,” now has a bachelors degree from Stanford, a law degree from Harvard Law School and a masters of fine arts degree in writing from California College of the Arts. She’s worked in the legal field as well as a dean at Stanford. Her memoir explores Lythcott-Haims’ own struggles with her race, what it means to be black and the overall culture of racism that exists here in America. As a white woman who grew up in a racially diverse area and now lives in a racially un-diverse city, it was uncomfortable but not unpleasant to read this intimate look at how subtle racism can be — and how in your face it can be as well. It’s not something I thought about as a child, when race seemed fluid to me. Or even as a young adult when I envied my coworker’s chocolate skin and how it allowed them to glide smoothly through the areas I worked and lived in, while my own pale skin drew attention. To me — to my point of view — I was the outsider. I never thought those coworkers could feel like that too. Perhaps they didn’t. Or maybe they did. The memoir takes the reader on a journey from childhood to adulthood, as Lythcott-Haims came to know, understand, accept and love herself, as someone who felt very much like an “other” for so long. A culture of racism impacts her, her family, her children every day. It explores the specific worries she has for her son, whose dark skin makes him stand out, and for her daughter, whose light skin makes her existence so different from her mother’s. Racism is in the news and on social media. It’s part of a national dialogue. But not it’s not where you live, right? Except it is, even when we don’t actively see it. And this is an profound look at how it feels, smells, tastes and influences lives. It provides a window into a world that my white existence has never really seen and couldn’t wrap my head around. It’s honest and raw. It gives clarity to things that only existed in the abstract for me. It’s important. Told in poetry and prose, with chapters separated into parts short and long, this book is highly digestable — the kind of book you can pick up for a few moments in the recesses of your life, read a section and return to later. Some days I would devour section after section. Other times, after a particularly raw or nuanced section, I would pause. Reflect. Mull it over before continuing. Buy this book. Read it. Let it make you uncomfortable. And see how the world looks so different to folks who are not you. This seems especially relevant to me today. I was listening to the radio – with African American DJs, discuss the NFL kneeling situation and they were taking calls. One man “John” called in to say he was supportive of protest, but not the kneeling, because it disrespects the flag, when the complaint is really against law enforcement. I snorted. And then I made a remark that “John” was obviously a white man. Which I then had to explain to the only other person in the car – my 5 year old. It’s important for him, for us, to recognize systemic racism.